MillTurn centers are on the increase, which are turning centers with live milling tool on the tool post with C-axis spindle control. Manufacturing view feature recognition library has added a new functionality to recognize such C-axis features in MillTurn module, apart from recognizing turning and milling features. FR further classifies the feature into C-axis-pockets and C-axis-slots as shown in Fig 1. Bevel cutting in thick plates can be cut in laser/plasma/waterjet/milling machines with tilt head. 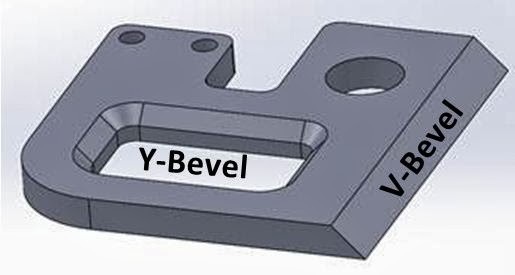 FR has developed bevel feature recognition in which four types of bevels such as V-Bevel, Y-Bevel, X-Bevel and K-Bevel can be recognized. Bevels are not only recognized on just planar surfaces, but can also be recognized on bent surfaces as shown in Fig 2. Unfold can also be generated as shown in Fig 3 for components with bevel features. Sheet metal parts generally contain holes and cutouts. Holes can be simple holes, tapered holes, counter-bore holes, counter-drill holes and counter-sunk holes, as shown in Fig 1 from left to right respectively. Similarly, cutouts can also have such cross sections, which are termed as compound cutouts. Sheet metal feature recognition library can recognize all these compound cutouts and can also classify cutout shapes such as obround, rectangular with/without corner fillets and generic shapes. 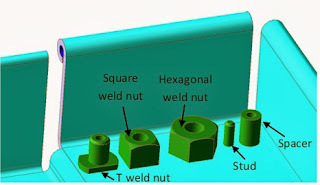 All these types of holes and cutouts are recognized by sheet metal feature recognition library as shown in Fig 3. Recognition of such features and associated parameters are very useful in automatic tool selection. For downloading evaluation version click here.